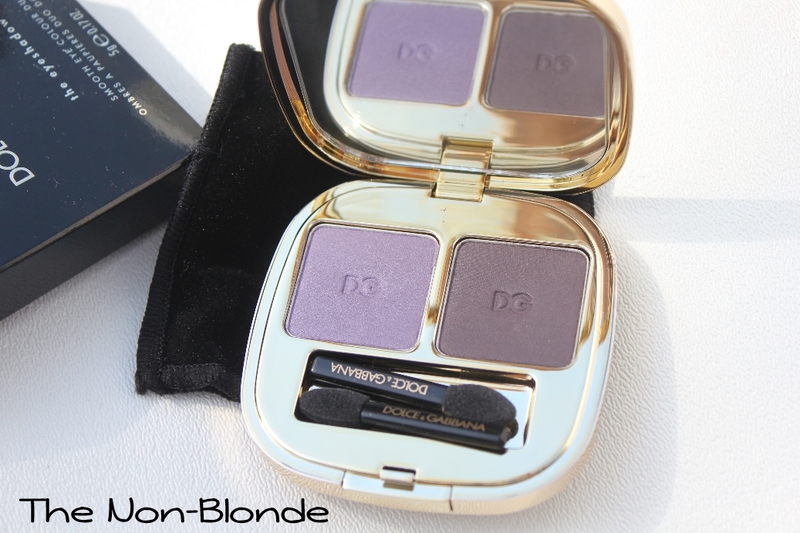 Gems 107 was one of the original eye shadow duos released by Dolce & Gabanna in 2010. Back then I bought Stromboli but skipped almost everything else, and since that duo never became one of my favorites I didn't come back for more. Certainly not for the very purple looking Dolce & Gabanna Gems, as lavender tends to bring out the corpse undertones in my skin. I received this duo for consideration from a brand rep that insisted it has a lot more potential than appears at a glance. It's kind of true: the right side of the compact is a very complex brown purple that I've found myself using in various combinations (gorgeous with a blue eyeliner). I still can't deal with the lavender. 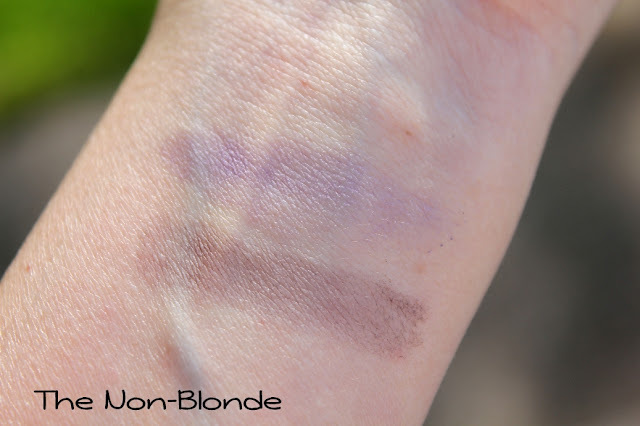 The first swatch shows you how light Dolce & Gabanna shadows appear on their own. I applied the colors with a fairly standard brush- Paula Dorf Contour Eye Brush over bare skin. We already know that D&G eye shadows look better over a good base: a cream primer such as Edward Bess, or a dark eye pencil smudged on the lid. 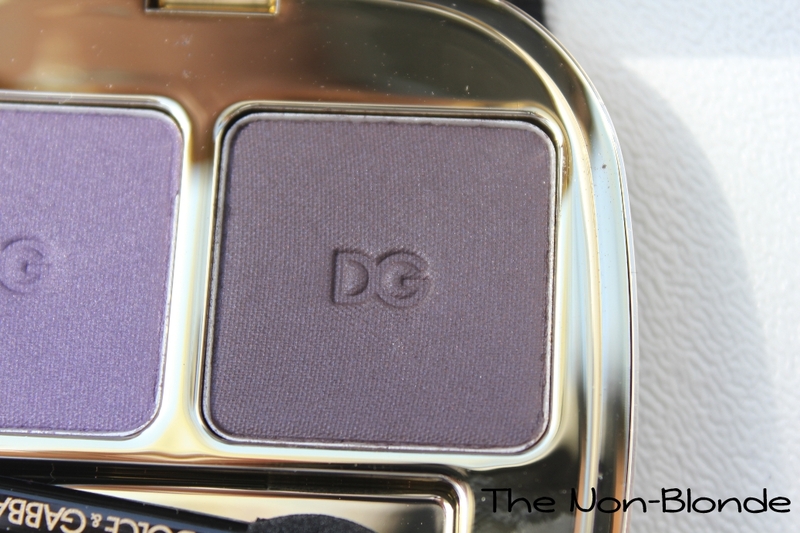 Last month as I was playing when the new Chanel Stylo cream eye shadows I dug out this Dolce & Gabanna compact for one of the experiments. 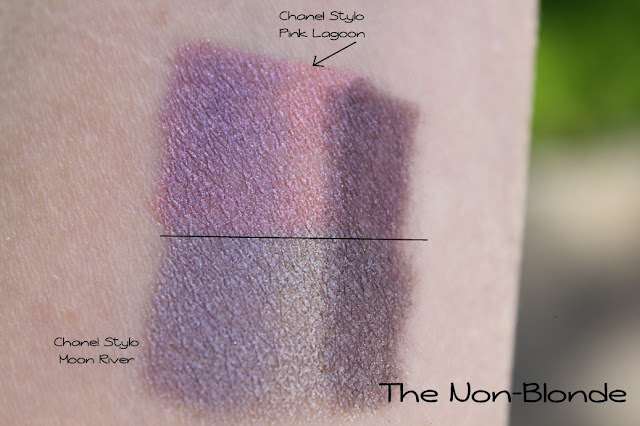 That's what you see in the last swatch: both sides applied over Chanel Stylo Pink Lagoon and Moon River. The color is intensified beautifully, and each cream base adds a new dimension or brings out more of the color complexity. Not pictured here but ended up even better is using the same technique with Chanel Stylo in Black Stream. The latter makes even the lavender side wearable for me. Bottom Line: more suited for green eyes, but has potential for the rest of us (see Charleston Girl's swatches on Best Things In Beauty). 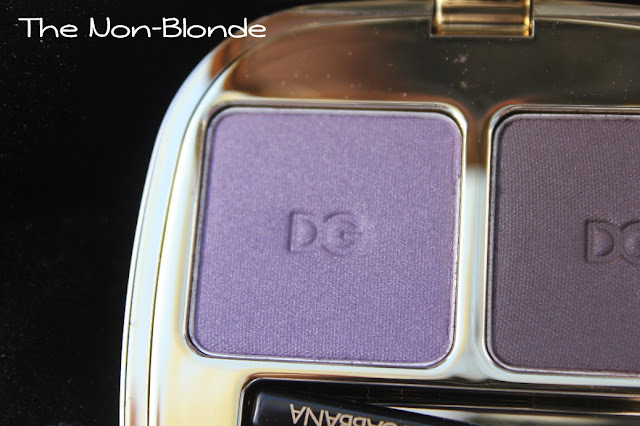 Dolce & Gabbana Gems107 Eyeshadow Smooth Eye Colour Duo ($42) is exclusive to Saks (Sephora doesn't carry this one). Since it's one of the older items, Saks sort of hides this one and you need to click on the "Choose Color" drop-down menu to even see that it's actually in stock. Don't get me started on Saks and their website, especially the beauty section. The product in this review was sent to me free of charge. OMG!!! This is so pretty. I super love the shade for they will make a natural and light look. I usually prefer these kinds of shades for it really enhances my eyes. That's a beautiful idea to work the shadows with Chanel's new Stylo Cream Shadows. The stylo choice really pumps up the color and adds an interest to the duo that wouldn't normally be there. The difference in finish makes for more interest as well.